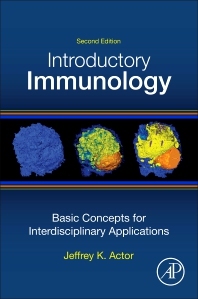 Introductory Immunology: Basic Concepts for Interdisciplinary Applications, Second Edition is a completely updated, revised and expanded resource on the immune system as a primary defense for the maintenance of health and homeostasis. The book highlights the components of the human immune system and how they work together to confer protection against pathogenic invaders. It also creates an understanding of the basis for clinical tests and immune therapeutics and their importance in identifying and treating disease states. This updated edition will strengthen the foundation required to understand the placement of immune function within clinical practice, thus allowing a basic platform to define therapeutic treatments. Jeffrey K. Actor, PhD is a professor and Medical Immunology Course Director in the Department of Pathology and Laboratory Medicine at the University of Texas Health Center at Houston. Dr. Actor received his PhD from the University of Massachusetts. His research interests include examination of host immune responses during parasitic disease, understanding proinflammatory and regulatory cytokines during mycobacterial infections, vaccine development, and molecular mechanisms of Lactoferrin immunomodulation.